New Feature Just Added to Pediatric Patient Education™! The HSLANJ Group Licensing Initiative’s Spring 2018 Offer is available! All medical librarians in the NNLM/MAR, SE/A, and NER are welcome to participate. This is the third in a series of articles, highlighting new features, products and collections from vendors. For more information on the HSLANJ GLI, contact Project Manager Robb Mackes (email or 570-856-5952). Deadline to participate is April 27, 2018. EMR systems can now search for the most-used Pediatric Patient Education handouts by ICD-10 or CPT code. The HL7 InfoButton makes clinical work more efficient by calling for the right patient education materials—and demonstrating Meaningful Use at the point of care—from the most trusted source in pediatrics. 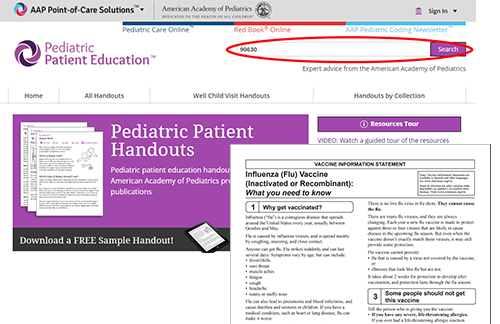 Use the InfoButton to easily search more than 100 popular handouts, including AAP’s Bright Futures and CDC’s Vaccine Information Statements. Users can call up the handouts within the system programmatically using ICD-10 and CPT codes. Additional handouts will be added to the collection in early 2018. When the clinician clicks on a search result, they are taken directly to the appropriate content page. Authentication and authorization take place at the time of access. This enables seamless, context-aware querying to save time and effort for health care providers, and it can also facilitate reporting and documentation for payment and Meaningful Use. Pediatric Patient Education is an important component of Pediatric Care Online ­– available through the current HSLANJ offer. For more information, please contact Allison Durocher (email).